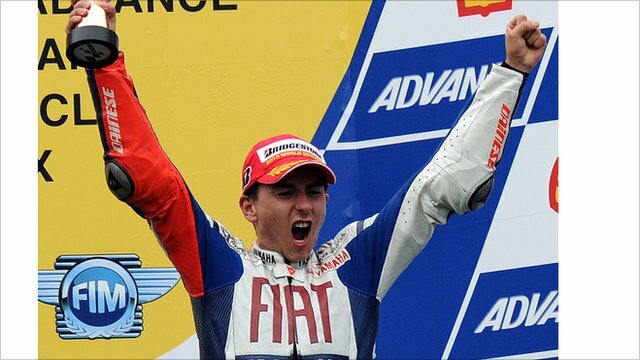 Jorge Lorenzo has been crowned MotoGP world champion after finishing third in the Malaysian Grand Prix at Sepang. The Fiat Yamaha rider came home behind Valentino Rossi and Andrea Dovizioso, which was enough for him to secure the title with three races to go. Reigning champion Rossi started sixth, slipped down to 11th but worked his way back up and into the lead on lap 10. Rossi, whose season was disrupted by a broken leg, held on for his first win since the opening day of the season. In contrast to his fellow Italian, Dovizioso got a good start from third place and was soon putting pressure on pole sitter Lorenzo. While Rossi slipped backwards through the field, Casey Stoner's hopes of a third consecutive race win were ended on the first lap as he crashed on the final bend. Dovizioso and Lorenzo broke clear of the pack while Rossi dragged himself back into contention, as he went in search of a sixth elite-class win in Malaysia. He closed the gap on lap nine, just as Dovizioso was taking the lead, and soon passed both the leading pair to go in front on lap 11. Lorenzo seemed happy to settle for a top-three finish, rather than do anything more risky, leaving Rossi and Dovizoso to battle it out for victory, and although they swapped the lead on lap 16, Rossi eventually held on for victory. Going into the race, the world title was Lorenzo's to lose. He only needed finish in the top 10 to be crowned champion in succession to team-mate and rival Rossi, and with the Spaniard's worst finish this year having been fourth, that was never in serious doubt. Before Sepang, Lorenzo had taken control of the world title race with seven wins. Defending champion Rossi's season never recovered after he broke his leg at the Italian Grand Prix at Mugello in June, meaning Lorenzo's fellow Spaniard Dani Pedrosa was his only serious rival for the title. But hopes of an end of season battle between the pair were dashed when Pedrosa crashed in practice for last weekend's Japanese Grand Prix, breaking his collarbone and putting him out of the races in Japan and Malaysia, although he hopes to return next week in Australia. "Today is the happiest day in my life and we have to celebrate it," said Lorenzo, who held up a 'game over' sign at the end of the race. "I was really impressed to be at the front and not to lose any time until the end of the race. "But when the tyres started sliding I thought, 'today we have to finish the race and get the maximum a rider can get in the motorcycle world.'" Afterwards, he admitted he had feared at the start of the season that he was going to be in for a tough season, having missed pre-season testing with a hand injury, but luck had gone his way. "You always imagine this moment and dream about it but when it comes you don't know how to act or what to say," he said. "But we came to Qatar and finished second, which gave me more confidence to ride fast and to keep pushing. Jerez was the most special race victory of my life and since then - seven wins, only two races without a place on the podium - what more can I ask for?". Rossi said he was "very happy" with his win and to end his barren streak, calling it "very important". He also paid tribute to his successor as champion - although the pair have been team-mates for the last two years, the nature of their rivalry has led to a wall being built down the middle of the garage. "Jorge deserved the championship because he was the best rider," he said. "He was consistent on every track in every conditions and never made mistakes." Pedrosa, who is back in Spain recovering from surgery on his shoulder, also paid tribute to the new champion. "He rode very well this year right from the beginning of the season and made very few mistakes - so he deserves the title," he said. "Of course, I would like to have been there today to try and keep the championship alive for a bit longer - even if we only had a very small chance of catching him. But it wasn't to be. "My recovery and physiotherapy after the operation is continuing to go well, and I hope to feel good enough for Australia and to get back to the level we achieved recently for the last races of the season."